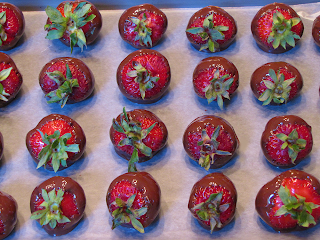 Summertime is the perfect time to bring chocolate-dipped strawberries to a potluck. I can guarantee that both you and your dish will be popular. I recently went to a potluck and emailed the host to ask how many would attend his “small potluck,” so I could bring the right amount. He responded that since I was bringing chocolate-dipped strawberries, plan for about 100 guests (followed by a smiley-winky face). I said I’d just fill up the platter, which turned out to be 30 strawberries. 10 people were at the dinner. The strawberries started to disappear as soon as I put them on the table, and soon there was just one left. Some guests literally drew straws for it, and then split it to share! This proves again what I’ve said before: There is no such thing as leftover chocolate-dipped strawberries. This recipe is like my Chocolate-dipped Strawberries for Four, but scaled up to use one standard bag of semisweet bits. 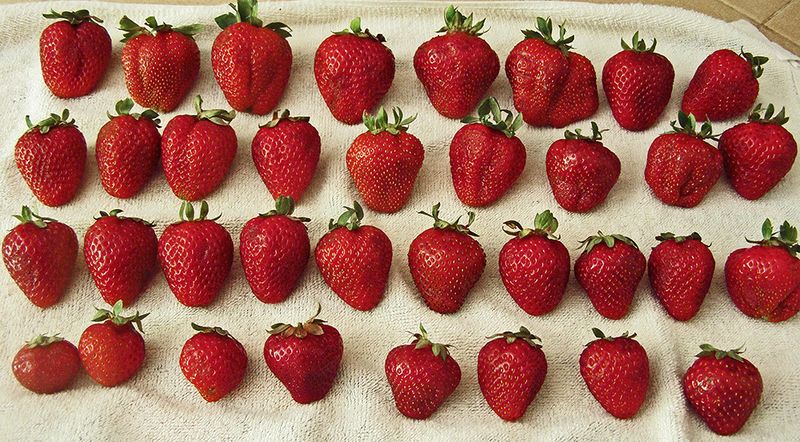 The number of strawberries that you can dip will depend upon the strawberry size. Allow plenty of time for washed strawberries to dry and come up to room temperature, at least 2 hours. On a very hot day you might need only 1 hour, but be sure they are dry and room temperature inside and out, otherwise chocolate might not stick. Sort strawberries by size as you blot them dry and set them out on a towel. You will begin dipping with the largest, working to the smallest, so that as the chocolate level goes down in the bowl you’ll be dipping progressively smaller strawberries. 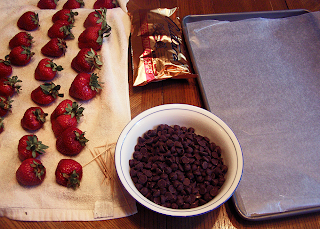 Clear off working area and get everything set up in one area before melting the chocolate: dry strawberries, waxed paper over cookie sheet or cutting board, toothpicks, melting bowl, small spatula, spoon to stir chocolate. 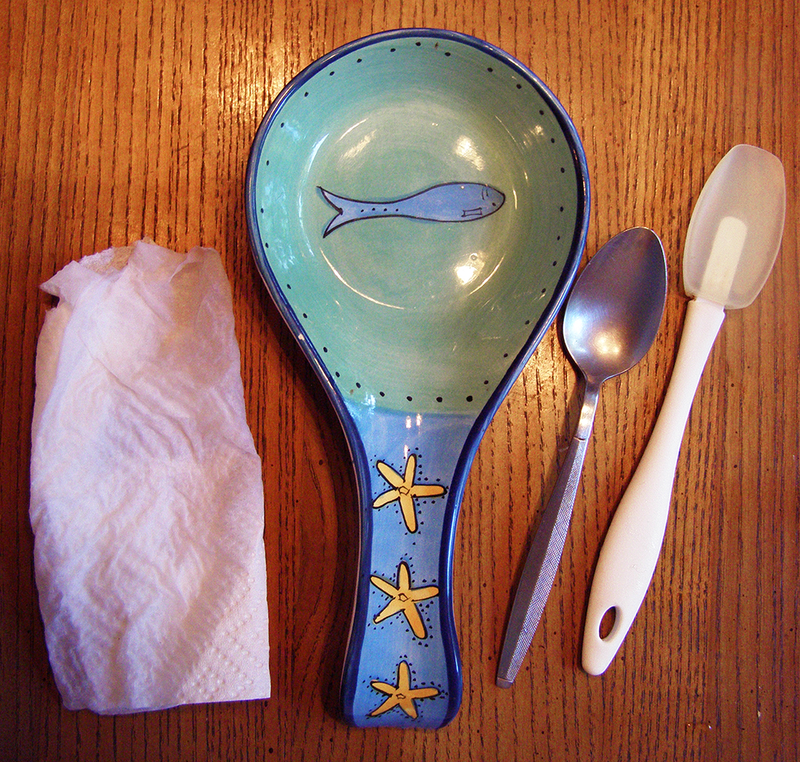 A damp paper towel and spoon rest in the work area really help to keep things neat. Believe it or not, not everything is better covered in chocolate (laptop keyboards & tabletops, for example). Use a narrow bowl with a rounded bottom for easiest dipping. It should a size that your hand fits into easily. Melt chocolate at small time intervals in the microwave, and stir between. All microwaves are different and better safe than sorry--if overheated, chocolate will "seize" into a hard grainy lump. Until the chips are almost melted you can use 1 minute intervals. Usually it takes two 1-minute intervals (plus stirring) to almost melt the bits. Once all the chips are melted, microwave at 10 second intervals. If chocolate gets thick while dipping (it will be hard to shake the excess off the berries), microwave again at 10 second intervals, stirring in between. 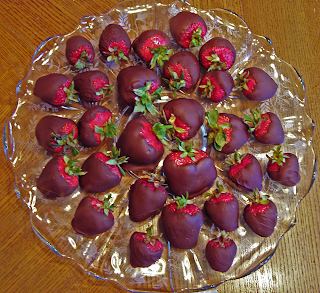 Serve dipped berries within 24 hours, or they can get watery. Prepare fruit beforehand: fruit must be washed, dried, and at room temperature. This takes about 2 hours if berries have been refrigerated and room is warm. Prepare working area beforehand: Cover a cookie sheet, cutting board, or other flat hard surface with waxed paper or parchment. You will need to put this into the refrigerator after fruit is dipped, so use an appropriate size. Set fruit near waxed paper, and leave a space for the chocolate bowl. Set out toothpicks to help dip the fruit, along with other dipping utensils (see above). Melt chocolate: Microwave in narrow bowl with sloping sides. Microwave for 1 minute, stir, microwave for 1 minute again, and stir again. If chocolate is NOT almost melted, microwave again for 30 seconds…if it IS melted, microwave for 10 seconds and stir again. Continue microwaving for 10 second intervals and stirring until chocolate flows off the spoon in a thin stream with no lumps. I use 10-second intervals (short!) to prevent overheating. Dip fruit: Some people grasp the green stem and leaves to dip the berries, others use toothpicks. I use both. The toothpick provides support so you don't break off the green leaves, and the green stems and leaves make it easier to maneuver the strawberry (see video below). Insert toothpick and grasp both toothpick and green leafy stem. Swirl around in chocolate, lift up and shake vertically a few times to remove excess chocolate, then twist strawberry so chocolate “drip” wraps around strawberry (see video below). Place on waxed paper and repeat process with other strawberries (if you’re careful you can reuse toothpick from first strawberry). 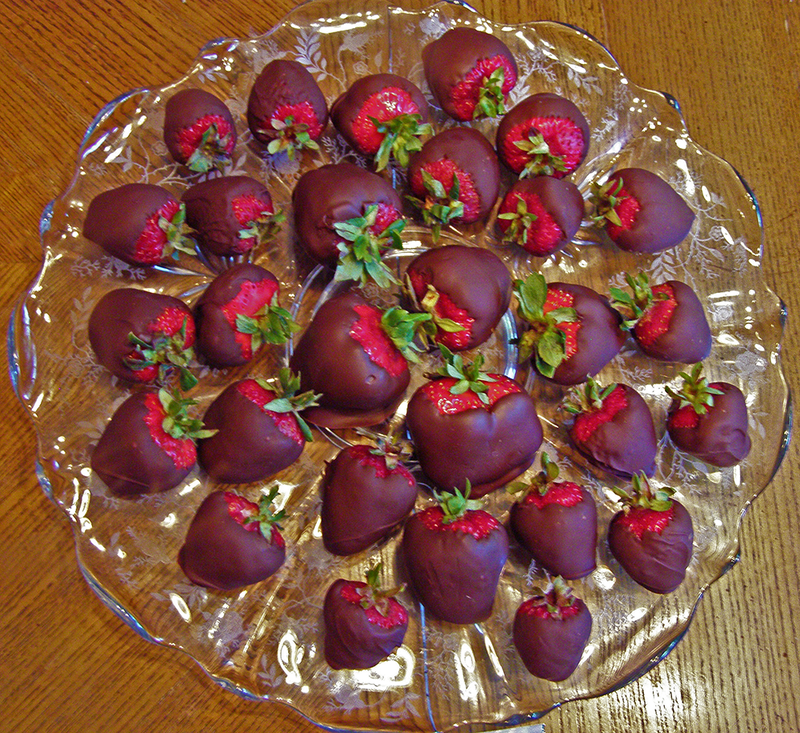 Refrigerate: Put tray with waxed paper into refrigerator until chocolate is set, about 1 hour. For optimum taste, remove from refrigerator let sit for 1 hour to come up to room temperature. Stand back and watch ‘em disappear!